We got this on sale the week of release! Great price! Even when not on sale it is cheaper to purchase this pack than the individual characters. The kids love playing as the villains! Randy is extra fun since you can make him invisible in the game!If you have the Wii version, you can only play 2 player in toybox mode. And remember in the playset modes characters can only play in their own world. For example to play Randy & Syndrome together you can only do that in the toybox. But you could play (eg.) Syndrome & Mr. Incredible together on any system other than the Wii. Tbook.com crawls the web to find the best prices and availability on Disney Infinity and related Toys products like Disney Infinity Figure 3-Pack: Villains. For this page, related items include products we find that match the following keywords: "Disney Infinity" at our vendor partner Walmart. 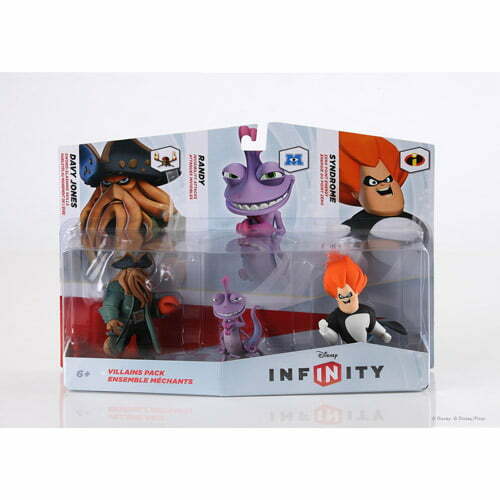 Disney Infinity Figure 3-Pack: Villains is one of 102 Disney Infinity and related products listed in the Toys section of Tbook.com If you have any questions on this product, please give us a call at 734-971-1210 during the hours of 9am - 5pm EST for assistance. Thank you for shopping at Tbook.com, the Internet Department Store!